New briefing for UK practitioners, how long should their Irish colleagues wait? 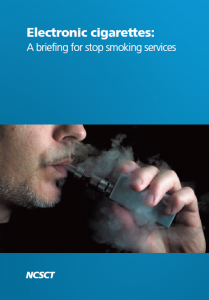 The UK body that supports the delivery of services across local, NHS and Local Authority stop smoking services, published an updated briefing on e-cigarettes yesterday. The National Centre for Smoking and Cessation Training (NCSCT) has taken an evidence based approach to the document, which has been reviewed by a number of public health researchers & experts, and – most notably – by current users (trustees of the UK charity New Nicotine Alliance). 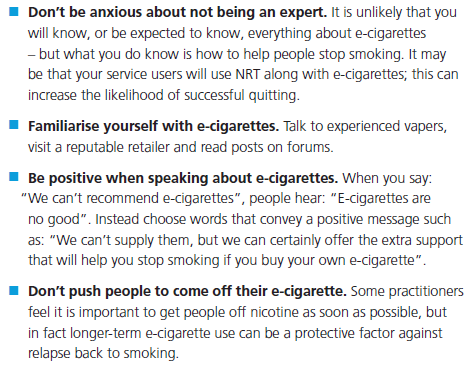 Produced in conjunction with Public Health England, the 46 page document aims to arm stop service providers with helpful and practical information on what to advise people who choose to seek the help of a stop smoking service, but would like to try vaping – all the while backing it up with summaries of the currently available evidence. To our mind, one of the most interesting and helpful aspects to the advice is the inclusion of common questions that smokers might have. 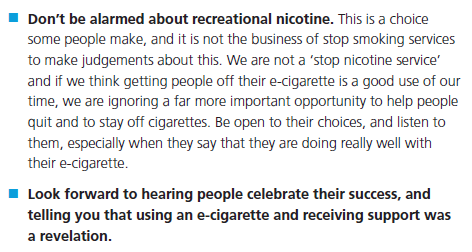 It’s also encouraging to see that the NCSCT advocates that practitioners seek out experienced vapers and familiarise themselves with local vape shops if they themselves are not familiar with e-cigarettes. – Which e-cigarette should I start with? – How often should I use my e-cigarette? – Is it OK to smoke and vape at the same time? – How will I know when to change the atomiser in my e-cigarette? – How do I choose a flavour? – What nicotine strength should I go for? – Will I end up using more nicotine with my e-cigarette and overdosing? – I’ve heard that e-cigarettes can produce harmful chemicals? – Is secondhand vapour from e-cigarettes harmful? – Are e-cigarettes normalising smoking? – Are there any adverse health effects? The IVVA understands that the Dept of Health and the Health Service Executive do not currently endorse vaping in their tobacco control policies. We are hopeful this will change. In the interim, this briefing may be useful in answering the questions which we regularly receive from Irish health care providers who either have patients that are already vapers, or who may be hesitant about making the switch from smoking. As our members are all now ex-smokers, we all started with similar questions. Should the relevant policy makers here decide to produce something similar, the IVVA feel it would be of enormous benefit, and we would warmly welcome it.